Booting servers from a storage area network (SAN) is being used increasingly in complex data center environments today, due to its significant benefits over the traditional method of booting from local disks. SAN Boot enables organizations to maximize consolidation of their IT resources, minimize their equipment costs, and realize the considerable management benefits of centralizing the boot process. In SAN Boot, you can deploy diskless servers in an environment where the boot disk is located on (often RAID-capable) storage connected to the SAN. The server (initiator) communicates with the storage device (target) through the SAN using the Fibre Channel host bus adapter (HBA). The system downtime is greatly minimized in case a critical component such as a processor, memory, or host bus adapter fails and needs to be replaced. The system administrator needs to swap only the hardware and reconfigure the HBA's BIOS, switch zoning, and host-port definitions on the storage server. The system image still exists on the logical drive, therefore the server is fully operational after the hardware swap and configuration change is completed. 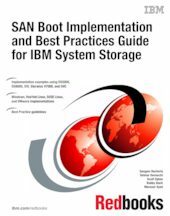 This IBM® Redbooks® publication can help you with the SAN Boot implementation. We present various SAN Boot scenarios using IBM System Storage® products that include DS5000, DS8000®, XIV®, and SVC. The operating systems that are covered include Windows 2008, Red Hat Linux, SUSE Linux, and VMware.